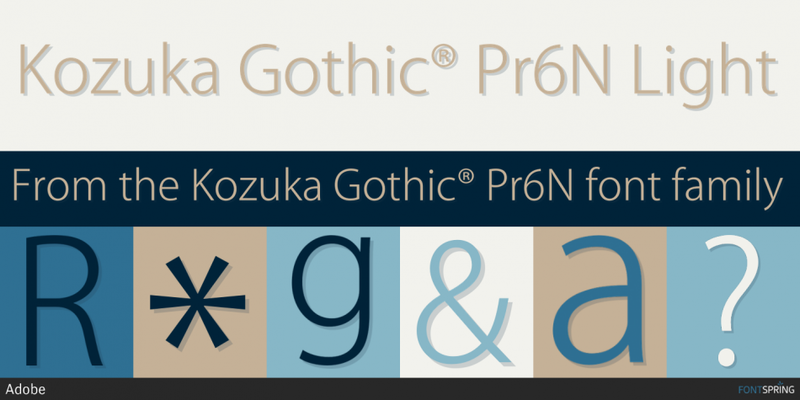 Kozuka Gothic is a geometric sans serif typeface available in 6 styles created by Masahiko Kozuka and published by Adobe. Inspired by Kozuka Micho, a well known Japanese font, Kozuka Gothic brings the same visual strength of a Gothic typeface. Containing six weights, Extra Light, Light, Regular, Bold and Heavy. Also Kozuka Gothic can be use for any kind of project from packaging, print, posters, headlines, t-shirts to web sites. Kozuka Gothic! A font description published on Tuesday, May 22nd, 2018 in Adobe, Fonts, Masahiko Kozuka by Andrei that has 1,428 views.